We spent 2 months in Australia and are pleased to find a fair number of craft breweries (their term) in a variety of cities. Mark took some pictures and put a bit of commentary about each one we checked out. Hobart, Tasmania – T-Bone Brewing Co. – we don’t have any pictures or comments for this brewery in Hobart because they don’t open until 2 P.M. on a Saturday! WTF! We found a few miscellaneous Australian beers during our 2 months. Italy has craft breweries, too. 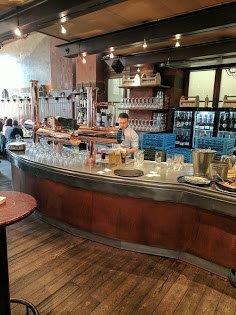 Lucca, Italy – De Cervesia Tap Room, 20 Via Michele Rosi – We tasted some of their beers on tap while we spent a week in Lucca. You can check out what we tried and how to find the place on the page above. It’s a real taste of Italian beer culture – lots of young people and only a few of the “over 30 gang”. Rome, Italy – Ritual Pab, 2 Via Cescenza, near the Supreme and Piazza Cavour – Nice clean tap room and restaurant with some good beers. The guys who run it were great to talk to and interested in discussing beer. They knew about the microbrew culture in Colorado so were interested in our opinion of their beer. Beers we tried in Africa – These don’t have stories to go with them but you can see the variety of beers and labels we’ve found in our adventures. Black Isle Brewery in Scotland can be visited at Black Isle, Scotland but we only tasted the beer at their bar and restaurant on Inverness, Scotland. They’re an organic brewery and make tasty beers. The restaurant has some interesting pizzas that we tried for dinner. Black Isle also rents out a few hotel rooms but we didn’t try those! 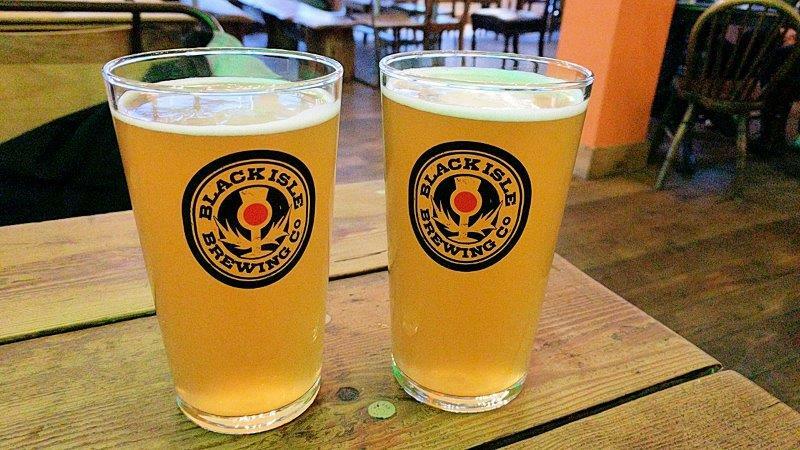 We tried a few different beers at Black Isle. The first round were German-style wheat beers. 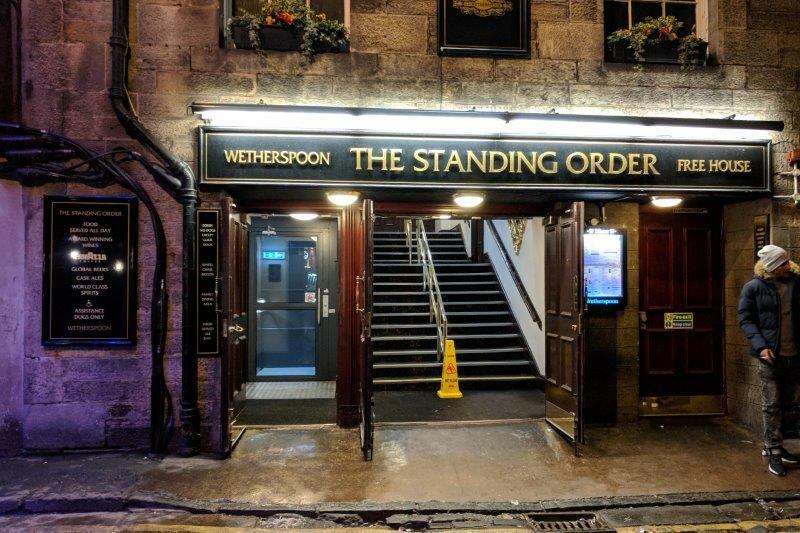 Standing Order Pub is Edinburgh, Scotland is part of the Wetherspoon collection of pubs and is in the old Union Bank building. It has a wide variety of different craft beers on tap. During the Christmas season at least, it was packed after dinner. Santa had even come for a visit. 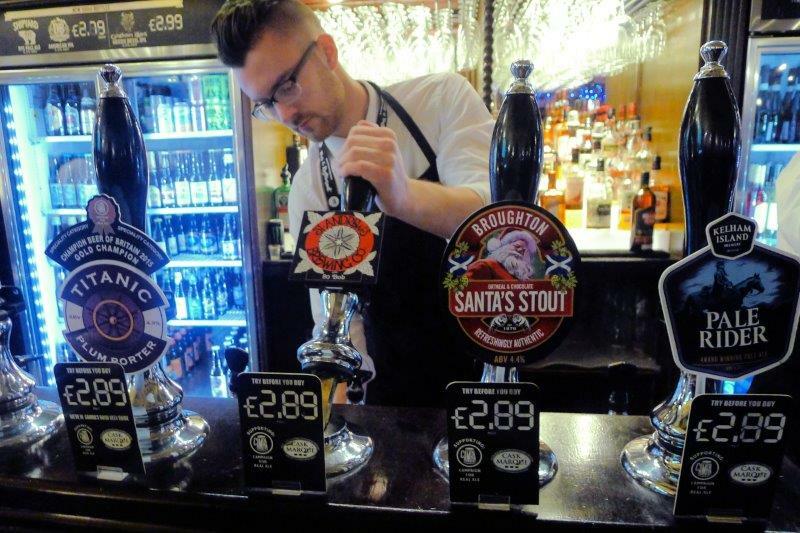 A few of the many craft beers on tap at Standing Order Pub. We went in the back door of the pub. It was the closest door on a cold night! 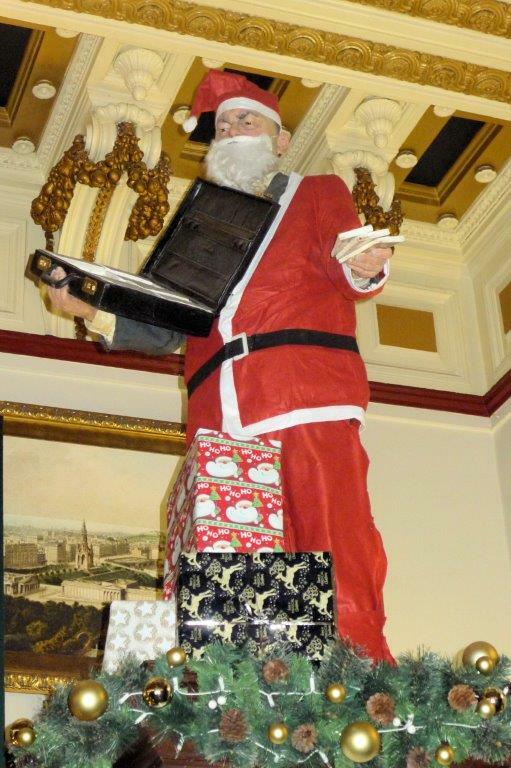 Santa had a briefcase full of money at The Standing Order Pub. He needed it to pay his elves! 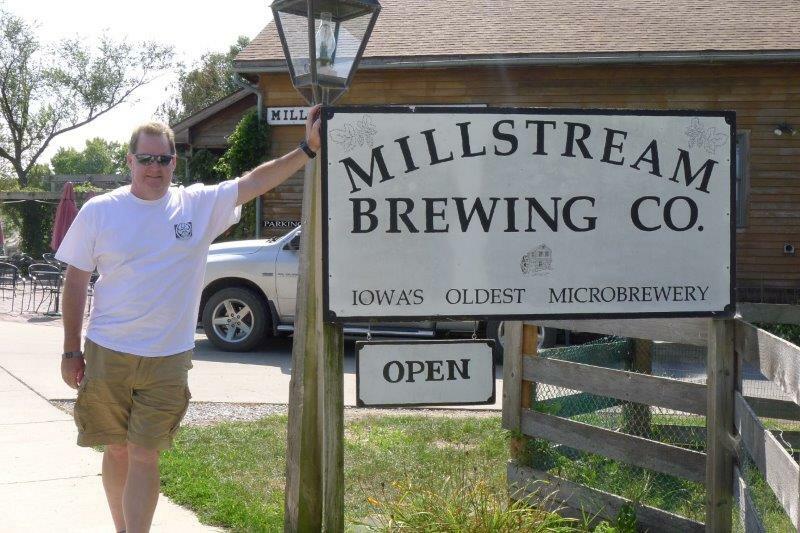 Millstream Brewery in Amana, Iowa, one of the Amish communities outside of Iowa City. Amana hosts Oktoberfest every September with about 38000 visitors in 3 days. The Hefewiesse and Oktoberfest were both pretty yummy. We shared the chicken schnitzel sandwich with German potato salad and it was a good accompaniment to the beer. 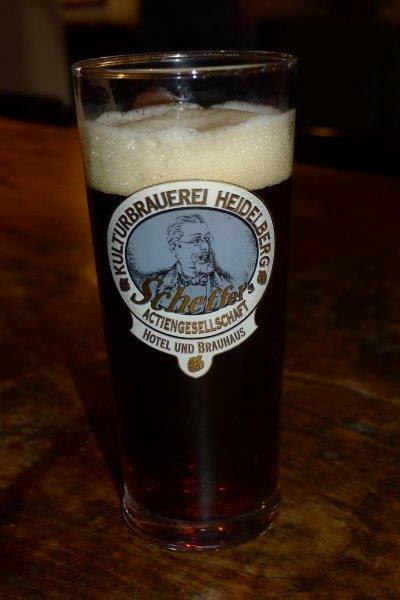 Kulturbrauerei in Heidelberg, Germany is on the site of the old Schaaf brewery in the city and makes yummy beer. I’ve toured it two times with a class and they do a great job of explaining how to make beer and the different types of German beer. 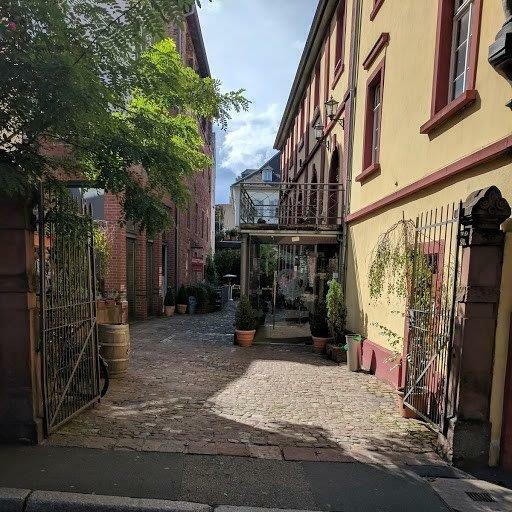 The beer garden is lovely in the summer and they serve good German food – pork roast and pork knuckle are two of our favorites. They have a hotel, too! 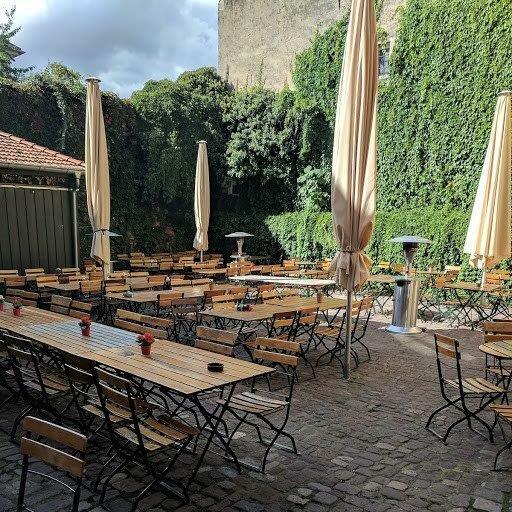 Kulturbrauerei beer garden – closed when we visited due to rain!